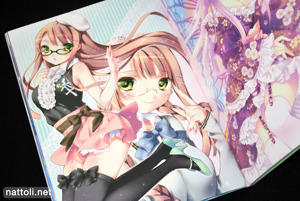 The lastest installment of collected E☆2 Magazine illustrations is Girls Girls Girls! 7 ~Anniversary Girl Collection~. The title belies the underlying theme, and the pictures on the whole tend to have a celebratory theme, or were illustrated for that purpose. 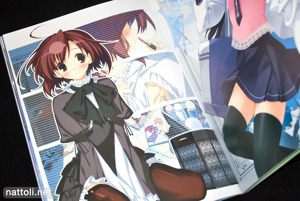 In all there are 52 artists participating in this volume, with some of the illustrations gathered from E☆2 Magazine issues as far back as 2007. Girls Girls Girls! 7 ~Anniversary Girl Collection~ is the usual A4-sized and 96-pages. 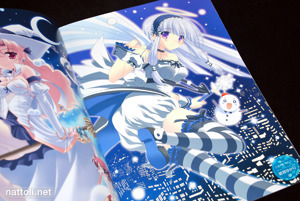 There are a total of eight illustration themed sections, starting out with 12-pages of New Year's zodiac animal girls. 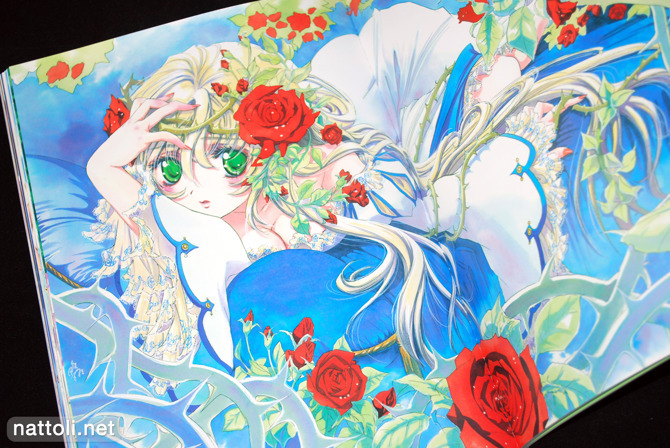 Each of the illustrations are done by a different artist, with art work from Mikeou, Noritama, Hinayuki Usa, MALINO, Kagome, and KEI just to name a few. The Angel theme is the next section of illustrations, although they're not all a standard depiction of the idea. Instead, some are angel costumes while others are closer to being fairies. Some of the girls don't even have wings ^^ There's a nice variety of artists featured, with Fuyuno Haruaki, Hayase Akira, Matayoshi, and ten others each contributing an illustration. 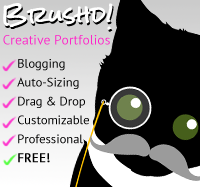 The next group of illustrations, under the heading Change! approaches the theme in a creative variety of ways. Goto P depicts a school girl with her middle school uniform in the background, posing for a mirror with her new high school uniform. A few other artists depicted girls with butterfly wings, as butterflies are a bit of a universal symbol of change. Miyu's illustration was definitely the best one out of those. Mikeou and Shiki Douji have contributed original works to several volumes of E☆2 Magazine, and three of these two-page spreads for each artist are gathered in this volume of Girls Girls Girls! 7. They're all printed with overlap too, as they are in the initial magazine publication. The next section is the titular Anniversary Girls, with 20 illustrations depicting girls celebrating everything from their birthdays to their wedding days and anything in between. Again, there's a great variety of artists in this section and some of the more notable illustrators featured are Watanabe Akio (Poyoyon Rock), Kobuichi, Kuuchuu Yousai, Shintaro, and Aoi Kimizuka. Though all the illustrators are excellent, the ones I named aren't E☆2 regulars so it makes it more of a treat. This seventh volume of "Girls Girls Girls!" does indeed look like a better book than the previous sixth volume. Lovely artwork by Tony Taka again. Kind of wondering if http://www.nattoli.net/art/8756/girls-girls-girls%21-7-illustrations-13 isn't by Kamiya Maneki, an artist personally only recently discovered, but I'm not sure. Yup, it is. I think there are three Kamiya Maneki illustrations in GGG7 as well as some in earlier volumes. She draws for Etsu pretty often. Great review, going to grab a copy. Love the first pic you chose, hopefully the quality of the whole book is good! Looks alot better then the 6th issue, but still it didnt rly conviced me to buy the GGG books :S.
I found GGG7 interesting. Fortunately it will arrive to me tomorrow ! ^_^ But I need to confess I was waiting more from it. 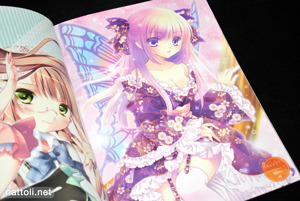 Anyway, the illustration made by Tony Taka makes GGG7 worthy to be bought. Anyway, are you planning to perform a review about Mitsui Mana's Metronome, nat ? I just ordered a week ago and I am wonder if I did a good choice. ^_^; Well... actually I am fan of the works made by Mitsui Mana. I bet it will at least be interesting. Not planning to, it wasn't one I liked ^^; But I'm not a Mitsui Mana fan, so that should help in your favor. Anyway, there are some illustrations made by Mitsui Mana which I find interesting. 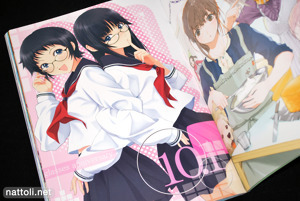 I bet it may eventually be good seeing them in an artbook.